Life is, at its very core, a journey, and every step we take during this journey has a profound impact on who we are as persons and how we relate to those all around us. This journey often begins with very simple tales where anthropomorphic animals face challenges that, once overcome, reveal a deeper meaning that teaches children the difference between good and evil, justice and injustice and so on. As we grow older, these teachings become part of us, but the magic of these tales fades away, becoming part of a very distant past that almost feels like it never happened. 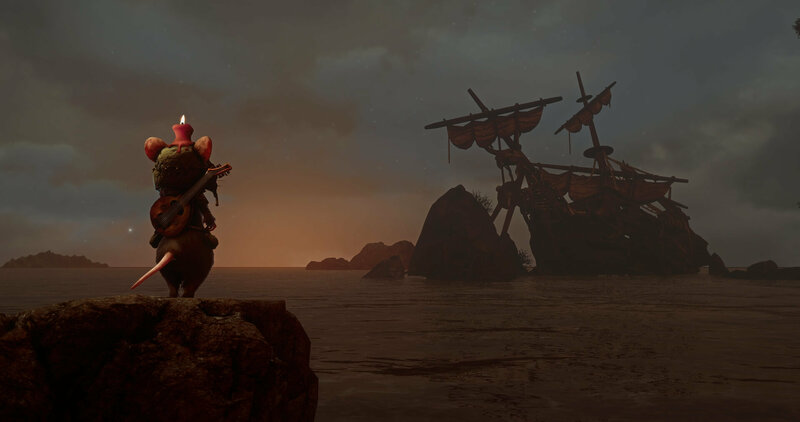 A game like Ghost of a Tale carries the same charm these simple stories had when we were children, showing how even a setting that may seem childish at first glance can be used to talk about some very serious themes. In Ghost of a Tale, players control Tilo, a small rodent minstrel who has been imprisoned for seemingly no reason and has been forcibly separated from his love Meera. Not one to give up easily, Tilo decides that he has to escape Dwindling Heights Keep and save his beloved from whatever fate has been forced upon her. During his quest, Tilo will meet a cast of colorful characters that will help him on his quest, expand on the world and tackle some very interesting themes, such as racism. The Ghost of a Tale’s story and character development are among the game’s best features. While the story is a simple tale on the surface, the many meaningful themes that are tackled during the adventure make it an extremely engaging experience. Writing is also superb, and it has some positive repercussions even on the actual gameplay. Many of the interactions with NPCs involve some “dialogue battles” that require players to pick the right dialogue choices to reveal quests, complete them and receive crucial information. The writing also makes most characters absolutely memorable. Ghost of a Tale is an action role-playing game, but it’s a bit reductive defining it just as a simple ARPG, as the game’s among the most unique released in recent years. For starters, it features no combat at all. There are plenty of guards and enemies to avoid in Dwindling Heights Keep, but players cannot fight them head on and must use stealth to make it past them. The stealth mechanics of the game are relatively straightforward, with a simple indicator appearing as soon as an enemy is in the vicinity. Once the indicator becomes red, the enemy will go after Tilo, and the only way to make it out alive is to get away from the enemy for as long as it takes to make the indicator become empty again. This is done by hiding inside chests and buckets or get as far as possible from the enemy. In order to not get spotted at all, players also have a few other options. There are items that can be thrown around to attract the enemies attention, and it’s even possible to knock them down temporarily by throwing bottles at them. The latter is also required to proceed in the game, as some of them hold important items such as keys that can only be obtained if the enemy is knocked out. The stealth mechanics, while not particularly advanced, add a nice layer of depth to the game and give it a very unique flavor. They also work quite well with the game’s premise: Tilo is not a warrior, and it wouldn’t have made sense to have him fight enemies head-on. The lack of combat doesn’t mean that Ghost of a Tale lacks many of the most important role-playing games mechanics. Tilo still obtains experience points by completing quests, and he learns some useful abilities that will make his mission easier, as well as grant an increase in Stamina, which is extremely important, as many of the actions he can perform consume it. There are also a lot of items to discover, some related to game progression, others that can be equipped to increase stats and give players a small degree of customization. They don’t impact the game all that much, but more options are always good. There are also some outfits to collect which not only alter stats but unlock additional dialogue options with NPCs and even give access to otherwise inaccessible areas. Quests are an important part of the game, and this is where Ghost of a Tale truly shines. Quests are extremely varied, and they take advantage of many of the game’s mechanics in very interesting ways, such as the day and night cycle. Quests are also tied to the main story, and they never feel like filler: they help players understand not only the world of the game but also the motivation behind their actions. The fact that all the content feels meaningful to the ultimate goal makes the whole experience extremely engaging. Sadly, not everything is well and good in Ghost of a Tale. On a regular PlayStation 4 console, the game is hindered by some technical issues. The camera gets in the way in a lot of situations, especially in small rooms and corridors. Performance is also extremely unstable, with the frame rate dropping way too often. The game doesn’t require precise inputs, but it’s still very distracting. A shame, considering how immersion is a big part of the game, and how beautiful the game’s aesthetics are. At the end of the day, Ghost of a Tale is a truly unique action role-playing game that tells a very meaningful story and sports some features that make the game stand out from the competition, such as the setting and stealth-focused gameplay. The technical issues, however, can get a bit in the way of enjoyment, but if you can let this slide, you will find an experience that will stay with you for quite a long time. Reviewed on PlayStation 4 (code provided by the publisher). You can purchase the game for PC via Green Man Gaming and for Xbox One via Microsoft Store. Ghost of a Tale is one of the most unique action role-playing games released in recent times. Its highlights are the charming story and characters as well as the stealth-focused gameplay. Sadly, some technical issues do get in the way on PlayStation 4, preventing the game from reaching its full potential. However, if you're looking for a game that can make you think, look no further, as Ghost of a Tale tackles a handful of very important issues in a mature and very thoughtful way.